about this book: Have you ever wondered what you dog would say to you if it could comment on your life? Dog Paw Chronicles takes you through my life journeys complete with observations by one of my many dogs. My husband suggested I let Red, (my former dog), observe me in the book, which at first I thought was a little odd. But it worked well. Comments from readers like "I laughed and cried sometimes on the same page" and "I truly enjoyed walking this road with you, but happily not in your shoes at times" are statements some have made in letters I've received. Life's Journeys are often the same for every person, even if circumstances in our lives are different. The principles that underlie a good life are often difficult to master. From the story of my birth, all the way to my life currently, the book is an honest look at everything from parents to trips overseas. 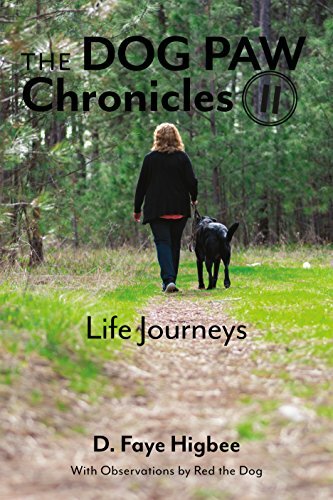 Dog Paw Chronicles can help the reader move forward from the bumps in the road –whether you fail at some like I have, or encounter tragedy, the book is designed with messages from a heart of compassion. Red crossed the rainbow bridge a few years ago, but he still speaks into my heart in the book– I hope he can speak into yours.